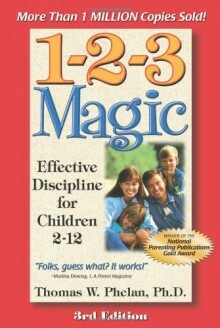 The award-winning, best selling '1-2-3 Magic' book provides practical and easy-to-learn parenting techniques that WORK for children ages 2-12. You won't need to study child psychology to understand the three simple steps in the program and get results quickly! Step 1: Control Obnoxious Behaviour. Learn a simple technique to get your kids to STOP doing what you don't want them to do (whining, arguing, tantrums, sibling rivalry, etc. ); Step 2: Encourage Good Behaviour. Learn several effective methods to get your kids to START doing what you do want them to do (cleaning rooms, going to bed, homework, etc. ); Step 3: Strengthen Relationships. Learn four powerful techniques that reinforce your bond with your children. You will also learn how to manage the Six Kinds of Testing and Manipulation, how to handle misbehaviour in public and how to avoid the Talk-Persuade-Argue-Yell-Hit Syndrome.